1- Meet me at the Gun Rights Policy Conference in Orlando, Florida! No charge to attend. 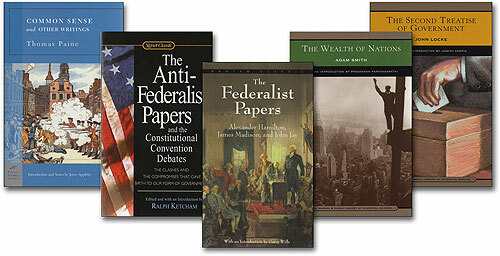 More than $100 worth of free books, refreshments, receptions. The most stellar array of gun-rights advocates assembled all year. Meet Alan Gura, lead attorney in the Heller and McDonald Supreme Court Cases. Meet the attorney representing George Zimmerman in the Florida self-defense case. The people making a difference nationwide will be there. Learn to be more effective as a rights advocate. as I hasten to make my flight. 2- There are no "guns on the street"
This is another example of a gun-controller myth that gets in the way of real solutions, and points to the need for gun-control counseling. The gun controllers' fears are so great they interfere with arriving at real solutions. My offer stands to meet with national "gun-control" advocates at a time and place of their choosing, and confront the main control issue of the day. Take me up on my offer. New York City's anti-rights mayor has pushed through his freedom-to-drink ban, forcing people to buy only small-caliber beverages. NYC stores will be thumbing their noses (sticking out their tongues?) at Mayor Bloomberg's nanny-state soft-drink management plan. The smart ones will be selling two or three government-dictated small drinks (at big-gulp-size discounts), with free empty large cups. (This has a fringe benefit of using extra paper products and supporting the timber industries. Freedom always finds a way.) Getting one full-sized drink in three or four cups will cost slightly more than a normal drink used to cost, but it increases a food store's earnings and stimulates the economy (at a cost to consumers) so it's not all bad. Only mostly bad. Two more proposals to add to the growing list. it is also important to press for laws that will help set things straight. 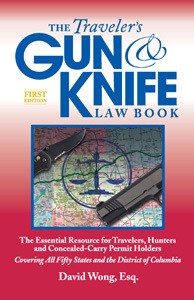 When a firearm is confiscated from a person, by a peace officer or other person with apparent authority to do so, the person making the confiscation, or that person's immediate superior, must ensure that the firearm is returned in a timely manner when the reason for the confiscation is resolved. If the firearm is not returned in a timely manner as established by the legislature, the person responsible for its return shall be fined, or for excessive delay, imprisoned, for a length of time as determined by the legislature. Posting a sign that falsely denies the right to keep and bear arms, or misleads a person into believing that firearms are forbidden in a place where the right to keep and bear arms is intact, is a class 1 misdemeanor for a first offense. Wrong way to draft such a law (and how legislators usually do it): It shall be illegal to post a sign that bans guns where they are not illegal to possess. Right way (and how we're going to start making them do it): Anyone who posts a sign that bans gun where they are not illegal shall go to jail and pay a fine. Florida has enacted such a law, and bureaucrats statewide scrambled to remove all their rights-denial signs the night before the law took effect. The hoplophobic, tyrannical, wet-their-pants, petty despots did their best to scare everyone into obeying their fear-mongering chicken-little blood-in-the-streets terror tantrums. To their dismay, the signs died, but no people died. All is well. We all need such laws. I'll get a copy of their bill and pass it around. 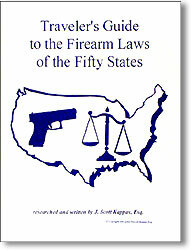 Read a collection of Model Laws, some of which have already been enacted. Your state could be next. 4. Do YOU Support "Universal Background Checks"? "Universal background checks" would mean every firearms transfer -- father to son, husband and wife, brother to brother, neighbors, friends, even hunting buddies, people at a range, and of course, the freedom of normal gun shows -- would all fall under total FBI and BATFE government control, in the name of crime control. These agencies that cooperated in the deadly Fast and Furious scandal would experience astronomical growth in the process. Every sale or even free transfer would require filings and clearance with central command. No one could get a gun without a government OK.
That is certainly not what the Founders envisioned when they wrote the Second Amendment. In fact, is the exact opposite of what got the American Revolution started and why we have the Right to Keep and Bear Arms today. But it is what the anti-rights anti-gun lobby is pushing for. Sometimes they call it "closing the gunshow loophole" -- until you read the bills they're drafting. 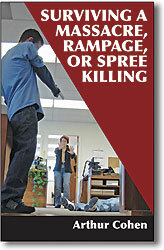 Then do it without compiling names of innocent gun owners. That's only reasonable and common sense. Even if the folly of universal background checks never goes from the minds of hoplophobes to the floors of legislatures, the expensive, list-compiling registry that is NICS needs to be eliminated. Sooner would be better than later. Government registration of gun owners (an unverifiable part of NICS background checks) is the first step to every genocide committed in the 20th Century. Every one. http://jpfo.org We know that can't happen here, right? And we're not even going to tempt fate. No government registration of gun owners. It serves no legitimate purpose. It expends vast amounts of scarce resources on tracking the innocent. And there's no need. Innocent gun-owner lists have no crime-fighting component, but at least they're extremely expensive -- https://www.gunlaws.com/gunreggie.htm. BIDS does an equal job of preventing prohibited possessors from buying guns. It costs far less -- totally eliminates the expensive call centers. Reduces downtime and delays legitimate dealers and customers must now endure. And it cannot make lists of buyers. Dealers simply reference the encrypted password-protected prohibited possessor list on their local computers with simple volatile search tools, offline. It's like using a computerized yellow pages. The list itself is updated constantly, as it is now. Hey, just like you, I don't want some mass murderer out on bleeding-heart parole walking into a gun store and coming out with a smokewagon. Gun owners are a common-sense reasonable crowd, just like anyone. It is time to scrap NICS for BIDS, and move this debate to a better place. Sure, the authorities and those with a vested interest will throw up every obstacle known to man, to stop this great improvement. Sure, a gun store could skip the system and sell to crooks, just like they can under NICS, and risk their licenses and long hard prison time. Sure there will be hard cases that will require referral to agents for extra checking and extra time, just like now. More freedom always is a good thing. less government and freedom from Big Brother. BIDS ain't perfect, we all know that, but it's as good first step. at least do it without compiling massive records on the innocent." Someone please tell me why Pat Condell isn't a figure on American TV. He has it so right. Again. "A word to the rioting Muslims"
What has a population the size of California (37 million), and a budget the size of the sales of iPhone and iPad worldwide ($90 billion), and gets virtually no mainstream news coverage, all year long? If something that big was hidden from view that well, would it distort the voting public's impression of what's important? In a report ignored outside industry trade outlets, the National Shooting Sports Foundation announced that members of Congress were briefed on the recently released data from the U.S. Fish and Wildlife Service's 2011 National Survey on Fishing, Hunting and Wildlife Associated Recreation to compare hunting and fishing participation and expenditures to mainstream industries. The 10% average increase in hunting and fishing over the 2006 report figures is economic good news somehow overlooked by the "news" media. "The economic impact of hunting and fishing is profound," noted Sen. John Thune (R-S.D. ), Republican Senate Co-Chair of the Congressional Sportsmen's Caucus, at the briefing. "People don't think about hunting and fishing in terms of economic growth," stated Sen. Jon Tester (D-Mont. ), Democratic Senate Co-Chair of the CSC. And they won't, since the media didn't convey the story. The guns, ammo and archery gear hunters buy annually is $6 billion, the same as the bicycle business, and much of it goes to businesses based in the U.S. keeping people employed in high paying steady manufacturing and related jobs. On the ground land conservation and restoration from sportsmen activity fees and taxes is $3 billion ($95 a second). The "news" media could not be reached for comment. No, that's not right. They didn't get the memo. Uhh, they were asleep at the switch. You know what it really is? They hate this subject and they hate you and they hate everything you stand for. And they think they're all peaceful and nice and the you are filled with hate. Read the caption again -- It does not describe the photo. In a move that no longer surprises anyone, but which the casual observer (you) no longer sees, the Associated Press abandons accuracy for reasons which remain unclear. With total disregard for their readers or for journalistic integrity, the AP, similar to their colleagues in other forms of "news" media, will tell you one thing while showing you something completely unrelated, and the sheeple simply soak it up. An accurate caption for the photo above would have to abandon the first clause ("Looking to renew his campaign"), because it has no connection to the photo whatsoever. It is actually a backhanded slap and editorial judgment, suggesting something is wrong and this man's campaign is hurting, giving advantage to the man he is challenging. 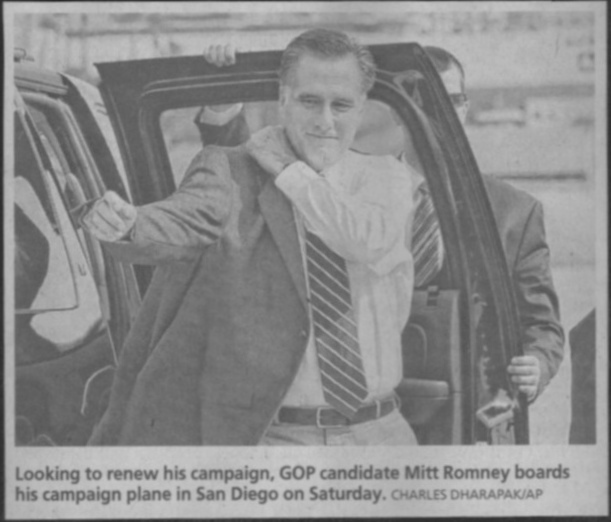 The remaining portion, if accuracy were any concern, would have to read, "GOP presidential candidate Romney handles his coat by the door of a vehicle," showing how vapid a picture the vaunted AP chose to use in showing a man running for the most powerful office on the planet (we do own the most H-Bombs). He is not shown boarding a plane. He is not boarding anything. It is not even clear from the photo that he is at an airport, or that it is Saturday, or that he is in San Diego, we just have to, hmm, take AP's word for it, whatever that's worth. Using this photo caption as a guide, it isn't worth much. No correction is expected. The AP has become a national disgrace. A laughable amateurish movie TRAILER released in JUNE (the movie itself has NOT been released), with hokey acting, kindergarten-level costuming, fake beards too chintzy for K-Mart, bad dubbing, a nearly incoherent script, in English without subtitles that illiterate Arabs could not understand, is being blamed by the Associated Press, attributed to jihadis and by the current administration for islamist jihadis' coordinated attacks on Western interests in the middle east, carefully timed around the anniversary of the muslim global jihad perpetrated in America on September 11, 2001. See the silly film: http://www.youtube.com/watch?v=JsIqjg3VkrE. The American president, Barack Hussein Obama, whose Arabic middle name we are not supposed to mention and which is UNIVERSALLY suppressed by the lamestream media for fears of associating him with his somewhat muslim roots, has his entire administration perpetrating the delayed film-trailer-caused-rioting myth, despite any evidence to the contrary. Hillary Rodham Clinton, whose middle name the lamestream pack media UNIVERSALLY uses to show they are not anti-feminist, is leading the delayed movie-trailer-myth propaganda campaign. Both Hussein and Rodham are featured in an Urdu-captioned advertisement in Pakistan disavowing any association with the movie trailer. Pakistanis reportedly do not understand this since, in Pakistan, all released films are government approved. In other news, the president of Libya said his government sources confirmed that the attacks were a coordinated effort celebrating the Sep. 11 attacks on America and were not a spontaneous attack arising from discontent among muslims over a three-month-old amateur film trailer. The administration downplayed or simply ignored the Libyan president's remarks. Members of the international intelligence community, according to CNN, similarly doubted the administration's explanations of the assaults. Also unexplained is how the extreme murderous anger of the Arab-Muslim-Islamist-Islamic-Hezbollah-Al-Qaida-Libyan-Egyptian-Tunisian-Middle-Eastern-Pakistani-Sudanese-Indonesian-Lebanese-Hamas-Jihadi-Extremist-AndSoOn factions was kept under wraps for three months so it all could explode in coordinated attacks spontaneously around nine-eleven by coincidence. Meanwhile, reporters nationwide were caught asking incredulous questions of sources, seeking to find out if the attacks were just coincidentally occurring on September 11, the anniversary of the glorious jihad in the United States. In other news, a CNN reporter found murdered Ambassador Chris Steven's journal in the ruins of the Benghazi embassy, three days after it was assaulted and trashed. The Hussein-Obama administration had no immediate answers as to why the embassy had been so poorly protected during the assault that left the Ambassador and three other Americans dead, or why reporters were able to roam around the ruins and find the journal, three days later, with no guards, no marines, no Libyan soldiers, no FBI and no crime scene protection. The State Department issued a stern rebuke to CNN for finding the journal, which CNN did not quote from but did use as a reference, and turned over to Stevens' family. The president could not be reached for comment, because he was scheduled to appear on Letterman, Beyonce, The View, and had to avoid world leaders at the U.N. Why U.S. officials did not find the journal first is unexplained as we go to press. And astounding. According to the Obama administration, reported by the AP and other lamestream outlets, Libyans carried Ambassador Stevens' body to safety after he was murdered because people were outraged over a movie made in the U.S. According to Libyan TV and posted on the web, the Ambassador's body was not treated with the decorum American's were led to believe. In other news, Piss Christ, a photograph of a crucifix displayed in a jar of urine went back on display at the Edward Nayhem Gallery in Manhattan. The White House issued no statement. The artist, Andres Serrano, lives in New York and is not in hiding like the filmmaker. Mr. Hussein-Obama's polling results in the upcoming election appear unaffected by the events, which he termed a bump in the road. 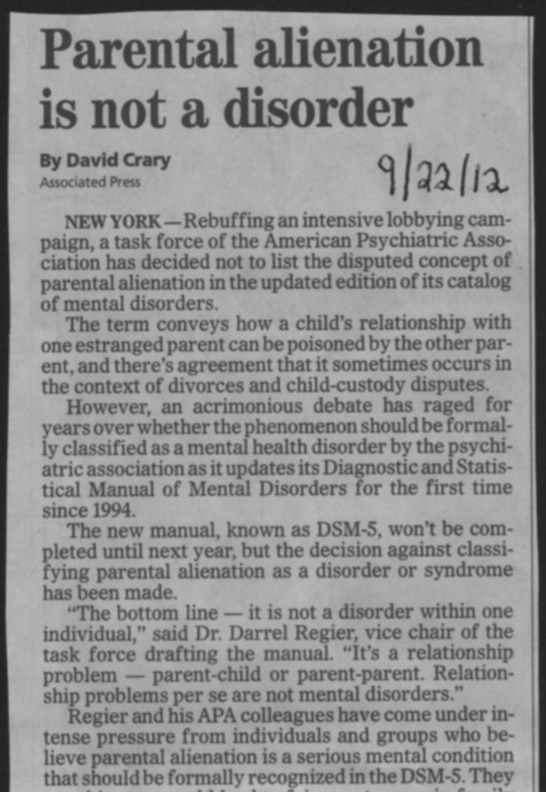 The fight over entries into the mental-disorder directory is heating up. not measurable science. They do not hide this fact. and trendy and cultural disorders can get surreal attention. While groups are lobbying to get marginal and questionable disorders into the official directory of mental disorders, the firearms and medical communities are falling down on the job of campaigning to get hoplophobia a well-known and politically damaging scourge the recognition and treatment its sufferers so desperately need. The abject terror many people experience when even mentioning guns is often channeled into the political realm, where it literally affects legislation, infringes on fundamental human rights that have been part of the nation fabric since its inception, and attack the strongest underpinnings of a free society. The nation expends huge resources in political battles when psychological counseling is obviously at least a consideration. It is often posited from within a small segment of the medical community that the core staff working on DSM-5, and indeed the medical professional as a whole is largely hoplophobic, and that this freezes out any serious consideration of the disorder. It would be funny if it weren't so serious, a sort of doctor-heal-thyself conundrum. Read Dr. Sarah Thompson's seminal thesis on the subject, or Dr. Bruce Eimer's commentaries. Idea: Ask YOUR doctor, dentist, gynocologist, whatever for an opinion about hoplophobia next time you have an appointment. You're paying the salary. That's your professional adviser. Get service. Ask. Tell me what you hear. I'll spread the word. And your doc will think. Medical doctor, name withheld on request: "The psych establishment is, well, hoplophobic, and I suspect any effort to get hoplophobia recognized as a serious diagnosis in the Diagnostic and Statistical Manual would be a wasted one." "You are welcome. As a psychologist, I have been treating people with the emotional disorder of phobias for over 30 years. have an underlying psychodynamic mechanism. of an assault although in many instances that is the case. Often, hoplohobics were abused emotionally and/or physically as children. idea of factoring bad people into the equation: gun + bad person = destruction does not occur to the psychological unconscious. It is too threatening to the psychological unconscious. It's less threatening CONSCIOUSLY to blame problems on inanimate objects." "I had never before made the connection between hoplophobia and projection. It's obvious enough that some people are terrified of firearms and some are terrified of anyone having firearms but it never crossed my mind that someone would be terrified that they themselves could have access to firearms!" Many gun control advocates believe that only two types of folks have guns -- cops and criminals. I grew up in New York City where this was and still is the prevailing view. People who believe that non-sworn citizens should not be allowed to own guns also tend to believe that anyone who owns a gun and is not a cop is a suspect. 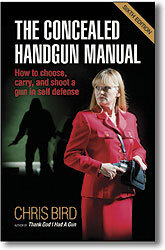 Thus, you often hear the sarcastic refrain from people whose lives have been threatened: "What should I do, buy a gun?" Most of these folks fear firearms due to ignorance and their socialization. However, there is a larger group of folks who have an irrational fear (aka, "phobia") of firearms (aka, "hoplophobia"). I have met and also treated many such folks. As a board-certified licensed clinical psychologist with over 30 years of clinical and academic experience, I think hoplophobia should be added as a diagnostic category to the Anxiety and Phobia Disorders section of the soon to be published revised edition of the American Psychiatric Association's Diagnostic and Statistical Manual of Mental Disorders-DSM-V. Given my dual clinical and academic training as both a Behavioral and Psychoanalytic/Freudian psychologist and psychotherapist, I know that "hoplophobia" (fear of firearms or firearm phobia) is real. It is as real as arachnophobia (fear of spiders), ophidiophobia (snake phobia), dentophobia (fear of dentists), aichmophobia (needle phobia), androphobia (fear of men), cynophobia (dog phobia), entomophobia (fear of insects), and ideophobia (fear of ideas). However, hoplophobia may be more widespread than all of the above mentioned with the exception of ideophobia, and unlike most of these other phobias, hoplophobia pervades every level of our society and poses a serious threat to our Constitutional Second Amendment and First Amendment rights. As a clinical psychologist, I know that what hoplophobics really fear is their own conscious and unconscious murderous rage. As with the psychodynamics of every true phobia, the hoplophobic person's psychological defense mechanisms unconsciously project his or her murderous rage onto other people and objects. In this case, the objects of choice are firearms. Only some hoplophobics are insightful enough to recognize, as one pro-gun control physician stated that, "I don't own a gun because if I did, I'd definitely shoot someone." He is right. He and others like him should definitely NOT own firearms. But, this is not a matter for legislation. 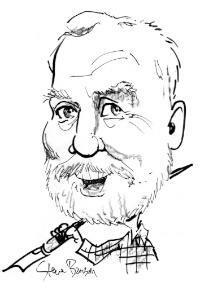 It is about having good sense and perhaps, psychotherapy - because after all, that is what good psychotherapeutic treatment is all about. My desk has more "news" on it than I have time. Gotta pack for the conference. I'll gather some news from there, and ruminate on it for the next Page Nine. The bloggers will blast it around fast, I'll cogitate and let you know. Phoenix Arizona, 1 p.m., get your tickets while they last, http://www.azcdl.org. I learned that churches are being fed abject lies in an effort to get them aligned behind anti-rights schemes for the coming legislative session. From one church newsletter before a live presentation: "We got off to a great start under the leadership of Rev. Jan Flaaten who presented the fact that Arizona has no gun laws." (emphasis theirs). I wrote the book on Arizona's gun laws, and these people, once again, are so misinformed they get in the way of progress and at the very least need counseling. More on that soon. Mr. Korwin, It's worse than you describe. Waiting periods did not merely do nothing to reduce violent crime, they enhanced it and ensured its success as countless women (and men, too) who discovered they needed a gun for self defense then discovered that the waiting period ensured a distressingly long opportunity for the object of their fear to realize his goals of their death and destruction. 15 days is a long time when you are trying to hide from a maniacally angry husband or wife or other thug. -John "Windy" W.